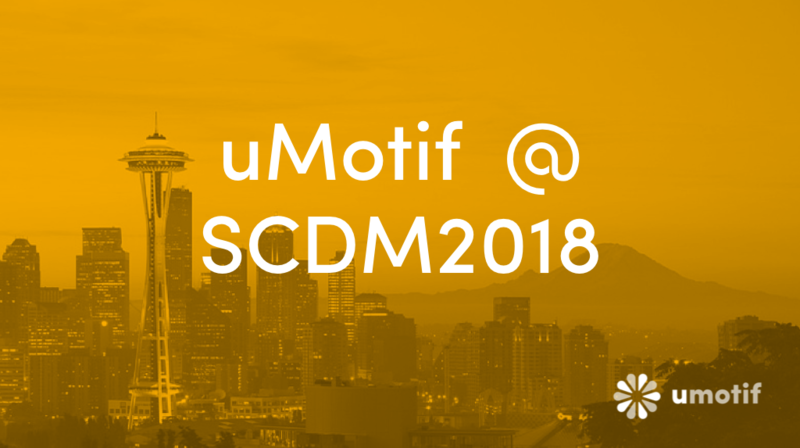 Meet the uMotif team at SCDM 2018 in Seattle, 23-26 September. uMotif are thrilled to be participating as exhibitors for the first time at the SCDM Annual Conference - the world's largest Clinical Data Management event. We are excited to be showing our uMotif platform to global life science specialists and delighted to see the real world data theme highlighted in the agenda. We look forward to the discussion, debate and dialogue underlining the importance of putting patients at the centre of clinical research. Hear the thoughts and opinions of uMotif CEO Bruce Hellman and Debra Harris, Associate Director, Pragmatic Health System Research, Duke Clinical Research Institute as they discuss the evolution of direct to patient trials and the latest developments in technology, privacy and security. Detailed session information can be found on the event website. uMotif CEO Bruce Hellman joins industry colleagues to discuss the patient of the future in this quick-fire presentation session. Meet Bruce Hellman, Jonathan Moshinsky and Jonathan Stone at Booth 314 to find out more about uMotif and see the data capture platform in action. Who knows? You may even meet our celebrity guest! The SCDM Annual Conference is the world's largest Clinical Data Management Conference, offering unrivalled opportunities to experience cutting-edge solutions and practices in the CDM industry. From September 23-26, in Seattle-Bellevue (Washington, USA), SCDM's goal is to inspire the healthcare sector, advancing our community's global ambitions.